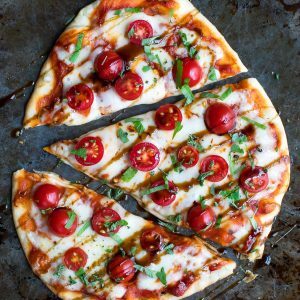 This Margherita Flatbread Pizza uses store-bought flatbread for a fast and flavorful personal pizza, perfect for busy weekdays! The #1 request I get from friends is for crazy easy recipes. Nothing complicated. Not too many ingredients. Speedy enough for a busy weeknight. <— I GOT YOU! Though I adore my time spent in the kitchen, school nights are straight up crazy around here. The last thing I want to do is trash the kitchen with a complicated recipe. I need something quick and easy that everyone will eat so we can tackle homework, bath time, and wrestle our little monkey into bed at a reasonable hour. Flatbread pizza to the rescue! Since there’s no dough to make, you can have a scrumptious pizza on the table in just 20 minutes! YES! Feel free to use naan bread, pita bread, or your favorite bakery flatbread to make this easy peasy pizza. You an even use with mini naan or pitas if you’d like. Kids (and adults!) go absolutely ape for anything cute and little. Recipe yields one personal pizza, but feel free to make as many as you’d like! It’s so crazy easy to throw together these tasty flatbread pizzas for your next weeknight pizza party! Pair your flatbread with a piping hot bowl of tomato soup or a healthy side salad. Want to add a little protein to the mix? You can add some garlic parmesan crispy chickpeas to your pizza if you’re vegetarian or try it with some sausage/pepperoni for a T-rex spin on this classic pizza. Let’s get our pizza on! Margherita Flatbread Pizza FTW! This easy peasy recipe makes one personal pizza and is easily doubled, tripled, or quadrupled to feed the whole family! Enjoy! Preheat oven (or toaster oven!) to 350 degrees F.
Spread flatbread with sauce and top with freshly grated mozzarella and cherry tomatoes. Add a pinch of red pepper flakes and Italian seasoning on top and bake for 10 minutes or until hot and bubbly! 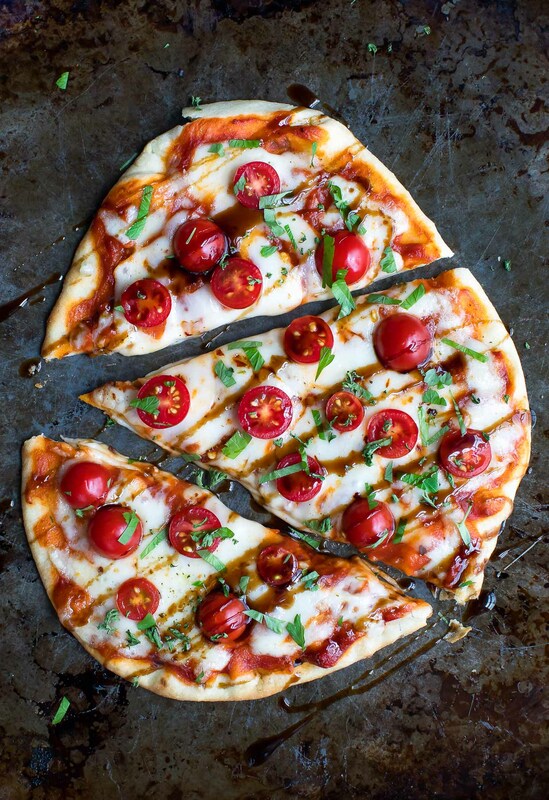 Top with a drizzle of balsamic glaze and a sprinkling of fresh basil. Yum! Feel free to pick up some balsamic glaze at the grocery store (you can find it near the balsamic vinegar and comes in a few tasty varieties) or make your own. For homemade balsamic glaze, mix 1 cup of your favorite balsamic vinegar with 1/4 cup brown sugar in a medium saucepan. Bring to a boil, then simmer until reduced by half, approx. 20 minutes. Sauce will thicken a bit more as it cools. Cool and store in the fridge for all your drizzling needs! 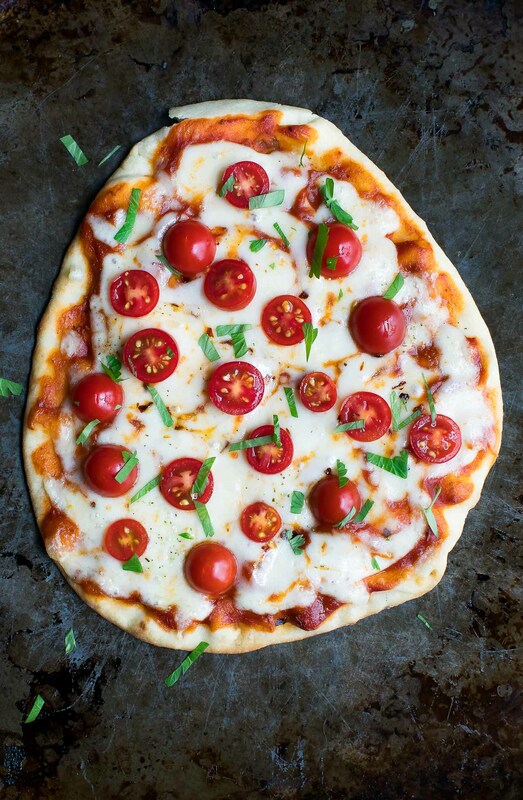 If you get a chance to try this Margherita Flatbread Pizza, let me know! Leave some love in the comment form below or tag your photos with @peasandcrayons on Instagram so I can happy dance over your creation! Looking for more flavorful flatbread pizza recipes? Check out our round-up of 7 Must-Try Flatbread Pizza Toppings and get ready to find a new favorite! Bell Pepper Pizzas <— Gluten-Free pizza FTW! Thank you so much for this recipe. It was absolutely fantastic. My daughter made this for her 4-H food-prep competition and won champion and a special prize for it. Crazy-easy recipes are definitely the best! This pizza is making my mouth water! So easy and delicious! 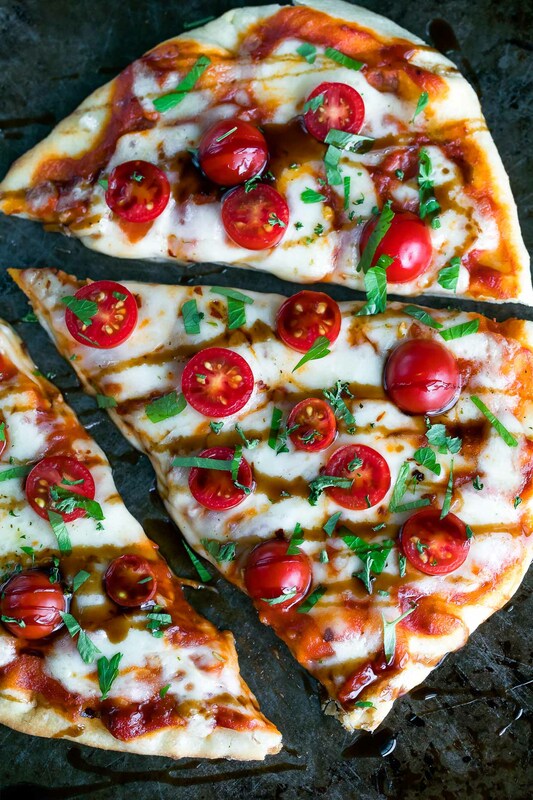 Plus, this flatbread is great way to showcase the flavourful tomatoes in season. 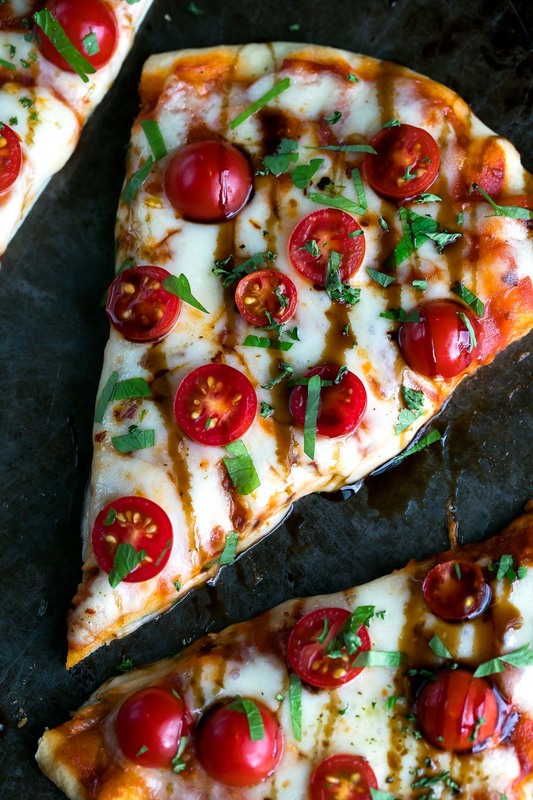 The added balsamic on this makes it so yummy! It’s the best finishing touch, right?! Love it so!